When Elizabeth Bilton received a call from her son last week telling her that “everything is OK,” she immediately knew it wasn’t. Her son, Justin, and husband, Charles, were safe — that much was true. But her motherly instincts were right: The camping trip the pair had been on in the backwoods of Montana almost took a deadly turn. On Aug. 12, Justin and his father became temporarily trapped in their car along a winding road in Glacier National Park, after a wildfire that started on the ridgeline not far from their campsite quickly spread, burning acres of trees and creating a wall of flames and smoke that surrounded them on all sides. 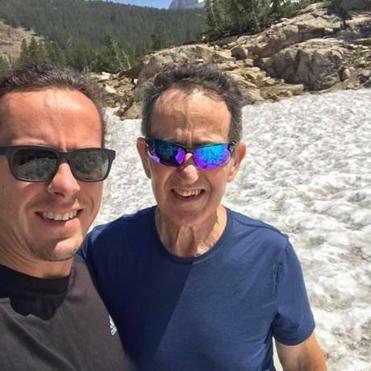 The Boston resident was on the last leg of a two-week vacation with his 70-year-old father when they found themselves caught in the harrowing situation, hoping to make it out of the fiery woods alive. Justin and Charles had driven down a dead-end road on Sunday to get to a trailhead that would take them to a campsite roughly two miles into the wilderness. 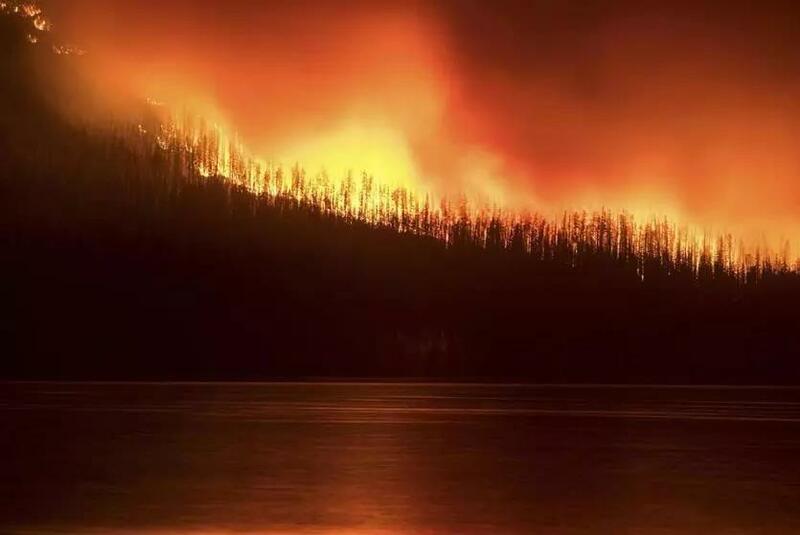 A fire burns next to Lake McDonald in Glacier National Park in northwest Montana on Aug. 12. A “small fire, by Montana standards” had started on Howe Ridge, near the lake, the day prior, he said. At first, both father and son were unfazed by the smoke billowing in the distance. They even talked to some fire crews in the area who told them the fire was unlikely to spread. “It didn’t look like it was growing at all,” Justin said. Justin Bilton (left) and father Charlie. The pair gathered their gear and headed through the woods toward their rental car, which they planned to drive back along Lake McDonald Road — the way they came in — to safety. Initially, there was some “fire near the road,” he said. But after they took a few more turns, the situation deteriorated. A video taken from inside the car as Justin and his father tried to escape the inferno shows embers flying toward the windshield like a swarm of bugs on a highway. To the right and left of the vehicle, limbless and charred trees were glowing through the smoky forest air. Flames lined the dirt road and seemed to reach up toward the car like orange snakes, making a slight hissing sound. That’s when things went from bad to worse: a tree ravaged by the intense fire had fallen down across the road, blocking their escape route. Once they were back at the trailhead, which was safe from the fire for the time being, they walked down toward a nearby cabin to see if anyone could help them. That’s when they saw a small boat floating on Lake McDonald, with two people on board. By Tuesday, Justin and his father were headed home to Boston, with little more than the clothes they had been wearing when they escaped the blaze two days prior. Looking back, Justin said he’s grateful that a series of fortunate events — and the help of strangers — got him and his father out of the life-threatening scenario. 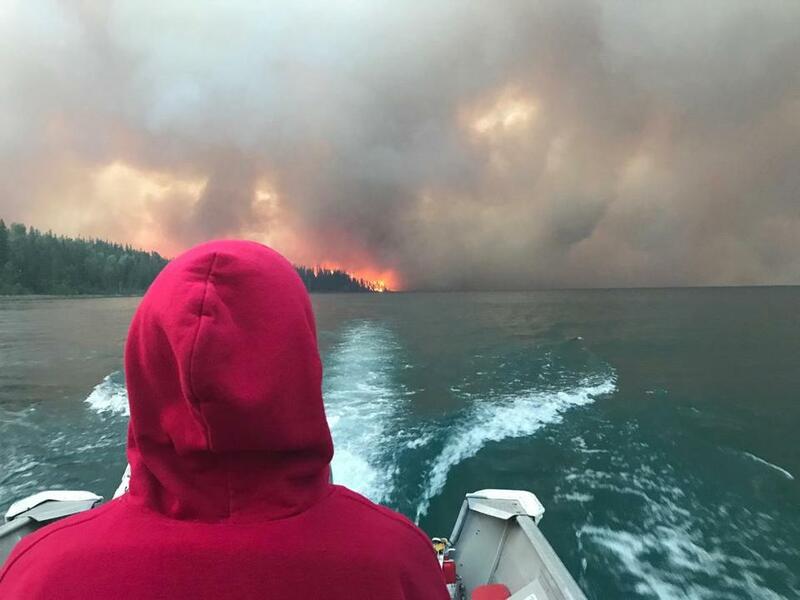 Justin Bilton looked out at the wildfire from the safety of a boat.